More difficult shortcut off Switzerland Trail. Shortcut route from town of Sunset to Highway 72. Usually done by drivers looking for a bit more challenge as diversion from Switzerland Trail, Trail #32. Views limited to looking back down the narrow canyon. Surprisingly, this is a county road, shown on maps as C.R. 95J. We found no markings on the route. Unlicensed vehicles use the route, but technically they are not allowed on a county road. Enforcement is always possible by the county sheriff, but this seems unlikely based on past history. Nonetheless, we do not show this road as open to unlicensed vehicles. Travel at your own risk. Open all year. We couldn’t bring ourselves to rate this road difficult, although a few places come close to this rating. It’s rocky and steep, but has no major obstacles. It’s a very narrow shelf road for most of its length, with very few places to pass an oncoming vehicle. 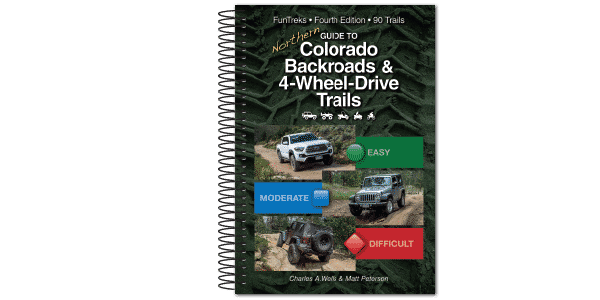 We recommend the trail be driven uphill because uphill traffic always has the right-of-way. If you drive it downhill, you may have to back up a considerable distance to let someone get by. We’ve changed the rating on this trail from moderate to difficult due to excessive erosion in the last few years.